The Virtuo Pro� is engineered with state-of-the-art ceramic technology that helps smooth down flyaways and frizzies and evenly distributes heat, so your hair will always have a salon-perfect, silky smooth, shining finish. With your help we can reach more people and let them know about Virtuo Pro Ceramic Hair Styling Iron whether this product works or not. OMG!! I cried this morning...after 12 years my flat irons died. I'm so lost I don't know what I'm going to do. I need a new pair ASAP!!!! These are the best flat irons EVERRRR!!!! I have had this straightener for over 4 years, using it almost daily. Just 2 days ago it gave out on me, one of the plates stopped heating up. I would highly recommend this straightener, a great investment! If only I could still find it! I bought it two years ago and I use it 3 times daily. Has been working like new. I love it and highly recommend it. 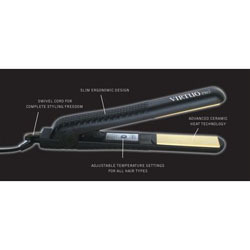 I have tried several brands and no one beats the VIRTUO PRO. I paid $80 for my Virtuo. It only performed ok, then after only a month, it quit working, now the vendor is gone, and I can't get my money back. I bought a Virtuo Pro and now it is broke and cannot find the vendor or phone number to call and have them replace it. I bought it for $70. It's ok, it didn't leave my hair exactly the way i wanted it. I should have bought the Chi iron. I thought it was really good. Left my hair very straight and soft. I was impressed with my purchased, shop around though. Not bad for a $75 ceramic iron, I have tried a few irons and haven't had one that worked as well as the Virtuo.